MD is at the press launch of the 2014 Kawasaki Ninja 1000 ABS in California. We are riding the bikes North from Los Angeles to Monterey. Yesterday, we put over 200 miles on the new Ninja 1000 … riding everything from freeways and back roads to a crazy little, beat up “road” that in some ways resembles a motocross track more than something you would take a street bike on (known as Santa Rosa Creek Road near Cambria, CA). Our ride continues on up to Monterey today via the beautiful Highway 1. This report will be brief, and followed by a much more extensive Part 2 a bit later. We have already described all of the changes to the 2014 Ninja 1000 here, but I want to highlight a couple of things in this first report. Kawasaki revised the damping settings of both the fork and the shock for 2014, and also stiffened the spring in the shock. Working together with the very impressive Bridgestone S20 tires, the bike seems to handle better than the model being replaced, particularly when ridden aggressively. The suspension seems to operate higher in the stroke, and although the new settings are stiffer, small bump absorption is excellent. The brand new monobloc four-piston brake calipers are really impressive. These are made by Tokico, although branded Kawasaki, and feature differential bore sizes for the pistons (30 mm on top and 32 mm on bottom). The pad compound has also changed. The result is powerful, controllable braking that does not fade (we did our best, trust me) during aggressive street riding. 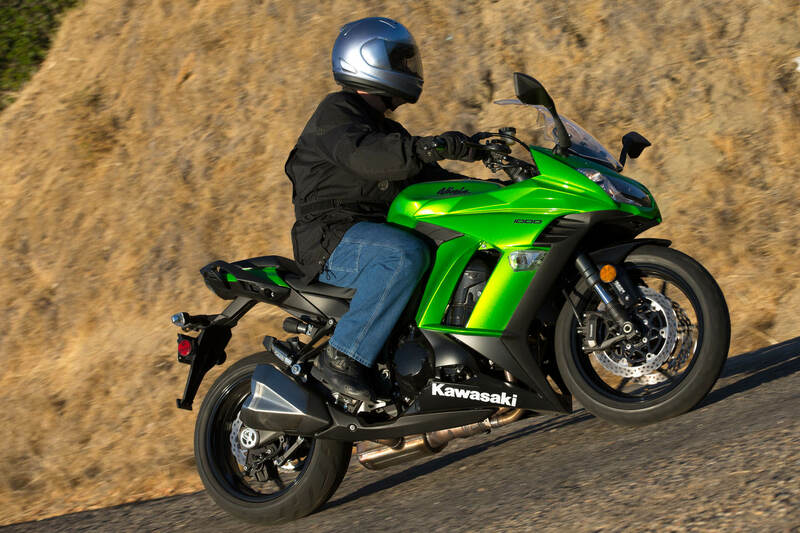 The engine performance is as sweet as ever, and even improved with the changes Kawasaki has made for 2014. Much more about this in Part 2. I am riding a bike with the new saddlebags attached today (they hold 28 liters each, not the 29 we reported earlier), and will give you more details on how well Kawasaki has integrated these bags (jointly designed with GIVI). Stay tuned. Having owned five Ninjas including the original “Top Gun” qualifies me as a Ninja Emeritus. My current track bike is a ZX10 but my streetbike of choice is my ancient but lovable ZRX1200. The big Rex gives power in a fairly comfortable package that allows for comfort with a reasonable street sporting prowess. This latest additon to the Ninja lineage is a bike to bridges the gap from the ZRX to the ZX line and is right on the mark for those of us that like real performance but want to enjoy an all day ride. Thanks to Kawasaki for recognizing those of us that still like to sport as much as tour. Ninjas rule! So, yeah, Part 2 would be great…. I mean, no rush. I don’t want you to work too hard. I’m sure that folks are not really curious about this bike. Maybe next week, if you happen to get around to it. Why can’t we just have the same bikes we used to have in the past, with the air-cooled engines, the big chrome gauges, the fussy carbs with the pull-out choke, the crappy points ignition, the flexy frames, the wooden brakes, the heavy, flexy spoked steel-rim wheels, and the narrow, bias-ply tires? This dad-blamed Ninja looks like some kind of insect from space. Down with progress! My 2011 Ninja 1000 is by far the best overall motorcycle I have ever had, and I have had many. But the tale is in what it is not. It is not as nimble as a sumo. It is not as fast as a ZX14. It is not as light as a Panigale. It is not as ungainly as a Concourse. That said – it is the most satisfying motorcycle around. It is solid, beautiful, competent, and reasonably priced. It is OMMFG fun and looks like the Bat Bike, but, you know – better. I had a ZRX1200R, and it is about as close as this one to a perfect all-around motorcycle as you can get. Sure, other bikes are more focused in their niche, but riding a niche bike has its downsides (ask any *honest* Duc or GSXR rider after about four hours on the road). I would buy another N1K if mine got stolen or crashed. And that’s all you need to know. There really should be a better way to hide those god-awful looking cat converters. Paint them black at least! It’s a shame that such a nice bike has to be made up to be a race bike. I don’t know if companies think we are that stupid, or if we just are that stupid. I’m guessing the latter, given the last 20 years of cruiser sales. So, now you can have a sports tourer in two flavors, crotch rocket or baja racer, not not just a plain sport tourer. It’s like the ZRX. What makes it a nice bike isn’t the style, I could take or leave that, but its ergos and comfort. I’m 36 (on the young side of this crowd, from the sounds of it)…and used to ride a Honda VTR1000 as a sport tourer, with Eclipse bags set up on ZenRails in a quick release system. I replaced it with a 2005 Suzuki DL1000 V-Strom, when I wanted something more comfortable for 2-up riding, and outfitted it with Krauser hard bags. And bring back the Gpz name…. Top Gun?) Really a cool movie. And innovative bike. Have they fixed the oil starvation issue that many of these bikes have had with the clutch? Where can I read about these oil starvation issues, I follow some forums regarding this machine and haven’t read anything about it. I am little confused with styling. Is this what used to be the full-on sportsbike (semi-racer)? It looks ergonomically speaking quite reasonable. But then, why the front of fairing (sorry, I have to say “beak” again) is so low? It should be matched so it creates more balanced impression. Then I even begin to like it; just like a decent machine for adult man. But, this is maybe Fazer’s territory I talk about. Why what do you ride that is so beautiful? Been watching this bike since it first came out. Great performance, handling and good ride comfort especially the relatively upright seating position. Right size for me-inseam challenged. Only reason I have not bought it yet is knee replacement so I’m bicycling to regain strength and endurance. Can’t have temptation around. Next year though. Hope they add the Bosch ABS system recently reported. There are great forums about better seats, larger windscreens and all sorts of things but there’s not much to change-as far as I see. How do they pronounce ‘Givi’? Is it Give-ee, or Gee-Vee? or what? Find an Italian and ask him. I test rode one of these when they came out. I expected it to really be near the perfect bike for me. Oddly, I found I didn’t like it nearly as much as I’d imagined. It didn’t do anything wrong at all, it just didn’t grab me like I thought it would. I ended up buying a 1400 Concours which does grab me and keeping my 1050 Tiger which is something on the order of the Ninja. I may try one again in the future, maybe it was an off day or something. As an owner of an ’11, this model has all the updates I’d been wanting from the start. Too bad it isn’t a fiscally justifiable idea for me to upgrade. Nothing wrong with my ’11, just that the ’14 is that much better. If mine should get stolen, I’d get a ’14 in blue. New pipes and aftermarket pipes and larger windscreen and I’m outta here! I told my wife I was seriously considering buying a Ninja 1000. She asked if she should get me one of those helmets with a mohawk on it to go with it. So even at 37, the Ninja name does come across as a bit squidly. Not to mention what most insurance companies do to their rates whenever they see ‘Ninja’ in a model name. Damned INSURANCE people, they’re all bums I tell ya! Try Rider Insurance. And yeah, I’m 64 and ride a ZX-14. Took my helmet off in a parking lot the other day and some guy getting in his SUV saw my grey hair and said, “Your grandson know you took that?” I enjoyed the laugh, but if getting old means I have to ride a cruiser, I’ll just go straight to a mobility scooter. lemme guess, black wit green accents monster energy edition…? Ha! I’m 64 also. Last summer I was out running back roads on a BMW and got pulled over by a county sheriff’s deputy who must have been 15 by the look of him. He started the “do you know why I pulled you over” speech and I said “earplugs, wait…” as I took off my full-face helmet. When I got it off the look on his face was “Whoa! Old dude! !” He let me off with a warning rather than a ticket for +20 over. Age has its perks, some days. Happens to me all the time. My touring bike is a Hayabusa. I also have a ZX-10R and an older ZX-10. I love the comments from other people. I turned 60 last week. I am getting close to buying another bike. Either the 2014 Ninja 1000 OR a new V7 Racer Record. I was stopped by an Oklahoma Highway Trooper earlier this year on the 10R. I took my helmet off, he started laughing. No ticket. I grew up on sportbikes. My kind of motorcycle. That’s what I was trying to get across a few weeks back. As motorcyclists we know the Ninja name, like it or not, but to me it comes across rather juvenile name wise. It’s time for it to grow up and get a more mature moniker. perhaps more importantly, NON-motorcyclists know the name. “Ninja” is one of those marketing exercises where name recognition of the moniker, has gone on to TRANSCEND name recognition of the core brand. same in car world. observe that there are no longer any “dodge trucks”. Chrysler has strategically promoted the “RAM” moniker to first position. Q: when you’re trading in niche business and damn lucky to have scored a USP… whaddaya do…? It may be in Kawasaki’s best interest to keep the name but as a specific name it has grown stale to me. I’d like to see it mature and I know I’d have no problem recognizing one without Ninja on the tank. 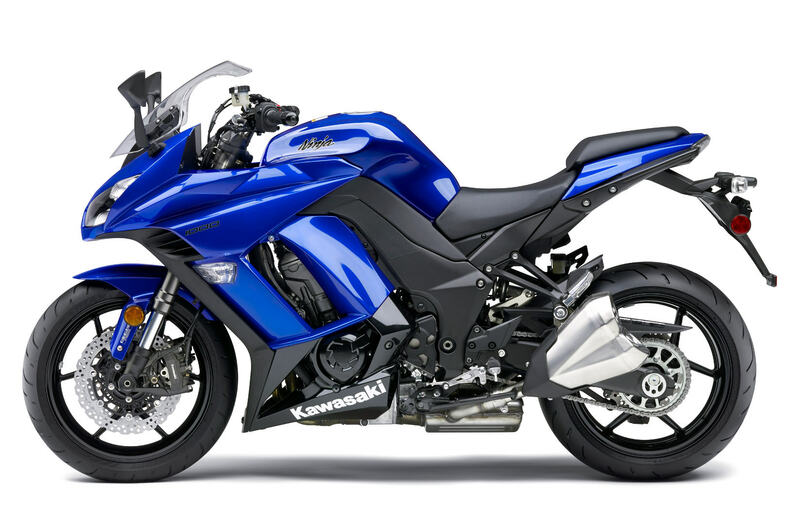 Just thinking of Kawasaki’s old Samurai name, same thing as Ninja but does not bring little green reptiles to mind. Would be interesting to know how many sales are driven by model recognition. Help me out here somebody: what is a “monobloc” brake caliper? A metal brake caliper that is usually milled out of a single block of metal. I guess you could cast a monobloc caliper as well. This compares to a “standard” caliper that is devised of two main sides and then bolted together. A monobloc caliper is less prone to any flex when braking. Almost all ‘monobloc’ calipers are cast, then machined for the bores etc. , but they are one solid piece. I think Brembo makes some high end ones that are forged, and I also think that the ultra-high-end unobtanium (like on a MotoGP bike) are milled. I am looking for to this review, in particular with the saddle bags attached and loaded. I at some point will need to replace my aging, but reliable Sprint 1050 ST, this bike is on my shortlist. I test rode the original and liked it, though the front end felt like it wanted to under steer. Like my 919 I liked taking it on the slab. Closed throttle fueling was not great but I stayed around it by keeping the throttle open a tad manually. I like more room to sit back on a seat, a flatter subframe but I guess they want to keep people from sitting back and getting too hard on the gas with all that power on tap. Nice ride. – Tested the new CB1100 yesterday from Bettencourts Honda and had a blast. I took some extra backroads before I brought it back. This is what Honda should have done with their spectacular VFR 800. Bumped it up to 1000cc, kept the integrated GIVI bags, gave it better suspension, adjustable screen, strong radial brakes, update the styling a bit and call it good. The V Four motor is perfect for sport touring. Instead we got the VFR 1200 monstrosity. Yeah 1000cc and the gear driven cams would have been nice. But noise regs stifled the gears. I did not need VTEC either but I guess that leaned their fueling. Regs again. Agree – I’m still holding onto my VFR800 – for years have been hoping that it would be updated …. not changed, as Honda has done. Absolutely agree with you. I was all lined up to buy the new VFR until I found out what an expensive pig it had become. I really think a change to 1000cc’s with a few things you mentioned would have made it a popular seller. I have yet to see a new VFR on the street which means nobody is buying it. “new VFR” – not to mention the awful riding position…what do they think, people want to take it to the track? Won’t say nobody as I’ve seen several here in the Seattle area. admittedly, I’ve only seen a few. i contend this can be DIRECTLY attributed to the devaluing mentality “moto-sumers” have towards the Japanese. no matter how good/innovative their kit, consumers begrudge them profitability and won’t accept “expensive” out of the Japanese. in contrast, had this shown up with a BMW or Ducati badge on it…? it would’ve sold like the proverbial “hot cakes”… and yet, it would’ve been the same sh!t. tell me i’m lying. Totally agree. I don’t understand how people still expect the Japanese to introduce a bike that embarrasses the competition at half the price. Nope, you are speaking the truth. The VFR is probably better and more innovative than anything Ducati or BMW offers, but cause it’s Japanese people start off with an inherent bias against it. To an extent, the Japanese have only themselves to blame. This is how they have marketed themselves in the Western world over the last two decades. Honda probably knew the new VFR would get the reception it got,that it would never be a money maker, but decided to build the bike anyway, as a design exercise and to make a statement, if not for now, then for history, when people can look back with more objective eyes. I think there’s a good deal of truth in what you say here Norm. The big VFR isn’t perfect, what is, but it is a bike that I’d feel most would love to own and ride if they only gave it a chance. I thought the VFR was a fine bike at 800cc. In my opinion, that engine would still be a great option tucked into a new, lighter, chassis. Wasn’t the 800 something like 540lbs wet? Given that this is a bike ostensibly designed for grown-ups, maybe it might be a good idea to call it something other than Ninja? I’m guessing that a lot of AARP candidates would be a little embarrassed to be be seen on a bike with a sticker that says Ninja displayed prominently on the fuel tank. It’s hard to believe that someone at Kawasaki didn’t bring this up while they were redoing the bike. My friend had the previous generation of this bike. He’s old enough to be in AARP (barely) and was in sync with your thinking. He removed the Ninja logos and replaced them with a combination of letters that he designed in a cool font and had made into vinyl decals. Looked OEM…and didn’t say Ninja. Hmm…I would have thought the “Ninja” decal on the tank was under the clearcoat. The “Extra Bright” color choices also seem to be for decidedly younger buyers… Younger than I would guess. +1 These two color options are dreadful. Love the concept. Don’t care about the name or the mufflers. Please bring back a classy, non-candy color. The black/grey scheme they had was purty. Red, black, silver or white — can’t go wrong with any of those. Yeah, that stupid word is the first thing I’d take off. It’s name for “hired assassin”. I also don’t understand that Kawi continues with such juvenile name for product which can cover otherwise broader specter of clientele. male mid-life crisis…? bueller…? anyone…? I am well past that age Norm. I think I am s conservative rationalist; do not like BS in any aspect of life. I like the pipes. I wouldn’t change them. I am not a typical Asian bike buyer. But I’ve liked and have thought about buying the Ninja 1000 several times. I think that it is a great bike that keeps getting better. Nice to see Kawi keeping the aftermarket pipe makers in business. Those mufflers are fugly. Agreed, although I think the look can be cleaned up with just some exhaust tips and not a muffler. It looks to me like the muffler itself is located under the bike (650R style) and those are simply tips that extend out. This keeps the weight low down on the bike and encourages a faster catalytic converter “light off” that alot of these bikes are incorporating into the muffler itself by placing it as close as possible to the headers.